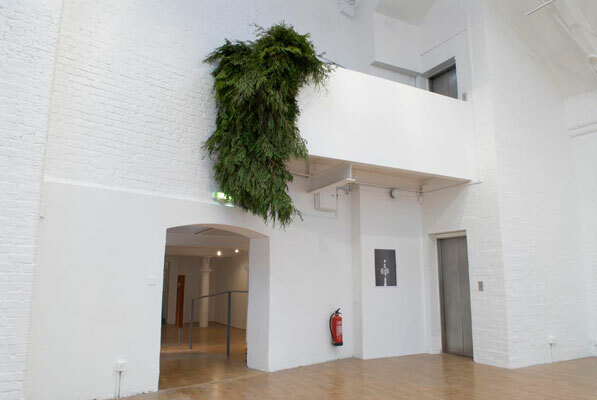 A sign insisted that access to Trisha Donnelly’s exhibition at Modern Art Oxford was gained via the museum’s front stairs; the three spaces that the show inhabited were clearly intended to be experienced in sequence. An optimist might therefore have expected an unfolding narrative, a progression of scenes, or an installation that, in having a front, a best side, signals awareness of the viewer who stands before it. Instead, the untitled installation of diverse objects that filled the galleries hovered uneasily at the edges of the rooms or in corners, like shy children pushed reluctantly into a party. The first object to catch fire in a corner of the viewer’s consciousness was a looming and lumpen structure near the top of the stairs. An off-balance pillar covered in baggy black fabric, it lurched towards the high ceiling, made two right-angled turns and ended pointing loosely back at the floor. Attached by straps to the room’s metal rafters, it defied all the expectations one might have of an object – and particularly a work of art – of its size. Without composure or convincing physical integrity, it seemed embarrassed at its own existence, responding to the space’s shape and dimensions without answering them in any sensible way. Just preceding this ungainly leviathan, but only noticed afterwards, was a small pencil drawing pinned to the wall. Hesitating between the authority of a diagram and the abbreviation of a preliminary sketch, it provided just enough information to invite contemplation but just little enough to permit decryption. A guide to the exhibition, written by Donnelly, began, not without a trace of irony, ‘Let me explain’. In a text incorporating the sorts of grammatical dead-ends and non sequiturs that she employs in her work she refers to the black fabric pillar as ‘a type of necessity … not a sculpture and not a prop. More of an appearance.’ The drawing is ‘a battery’, and Donnelly goes to some length to identify each of its elements and its role in an arcane and ambiguous system of energy production. At the far end of the space (‘I rate it as a ballroom’, writes Donnelly) the mood lightened as a mossy exuberance of evergreen Leylandii foliage frothed over the edge of a balcony. From behind it, a recording of soupy, upbeat lounge jazz played on repeat: the kind of culturally superior aural wallpaper that lines theatre wine bars. Vases of roses either side of the next doorway further encouraged viewers to drop their guard; perhaps Donnelly’s show needn’t be as taxing or unyielding as at first it appeared. After all, most of it looked, from a distance at least, much like the kind of art we are all familiar with, particularly the final room of drawings, paintings and prints. It is only up close that it looked somehow ‘wrong’. Gold panels seemed to employ the language of Minimalist painting but, as we neared them, turned out to be generously padded silk and velvet supports for concise, delicately painted marks that sent our understanding of them glancing off into fruitless figurative or functional interpretations. In a world in which aesthetic comprehension so often relies on comparison and cross-reference Donnelly regularly achieves the rare feat of creating images that simply look like nothing we have ever seen before. Very often she leaves the viewer trying to ascertain where accident, intuition, pragmatism and precise intentionality meet in her work. At the side of the second room a stash of spare Leylandii branches was piled at the end of a narrow corridor, a detail that for a moment seemed like a thrilling glimpse behind the scenes before one realized that the space was built by Donnelly especially for the show. Equally, abject chunks of yellowing foam shoved into a nearby ceiling became almost bewitching when it dawned on you that they were probably put there by the artist too. Donnelly’s skill is in pulling focus on the competing auras that attach themselves to spaces and objects. She creates things that bear on their surfaces enough strangeness to seem worthy of our time and contemplation, but which are resistant enough to leave a lingering suspicion that we might be just conjuring shapes in the darkness. The show’s final work was situated in the museum’s elevator: a framed black and white photograph, barely discernible in the dim lighting. The lift’s single-storey journey allowed scarcely enough time to register the photograph’s shadowy, capsule-like space, let alone guess at its significance. Existing in a fleeting moment in between two floors, like much of Donnelly’s work the photograph’s power drew on its bewitching shyness and its close-quarters insistence on distance.